Once I feel like I’m on the top of the world, it seems like I only sink to the bottom. Lately I’ve felt so ED-ish. All I want to do is NOT do what I need to do. Sounds pretty bad right? Just because I don’t want to do the right thing, doesn’t mean that I’m going in the opposite direction. I am still eating about the same, but I’m beating myself up about what I eat. When I say I, I probably should say ED. The feeling that I am working toward something that is hard for me to want, is still difficult to grasp. YES I want health, YES I want happiness, YES I want recovery. However, actions are way more powerful than words, I want the idea of it, I just don’t want to actually do it. This whole recovery battle is like a rollercoaster - one day I’m up, the next I’m down. I often feel hypocritical for posting things on this blog that sometimes I don’t even follow myself, but I suppose that it’s part of the process of connecting mind and body. Maybe thinking this stuff up is just the first step in the right direction. The month of December is knocking at the door already! What are you asking for for Christmas? I really want some new music to listen to, anyone got any favorites? By no means have I scoured itunes, but I’d like a place to start :) Bring on the music! 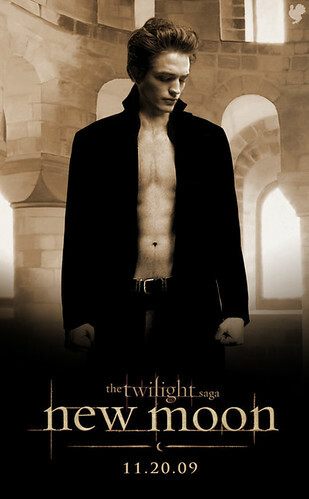 Okay, I’d never thought I say this, but – I HAVE TO READ THE TWILIGHT SAGA ASAP. Before seeing New Moon, I had no interest in the whole vampire seen, but now that Edward and Jacob have me smitten…it’s time to borrow my sister’s beloved collection of books. I loved the movie, despite having seen the first one, I caught on relatively quickly. Any readers or movie-goers out there? What’d ya think? Finally, I just want to thank all the new visitors and followers to my blog. It means so much to me to have such wonderful support! It's great that, even though your ED is ringing in your ear, you aren't letting it effect your progress. As far as music... I highly recommend the albums For Emma by Bon Iver, Fantasies by Metric, Do You Feel by The Rocket Summer, Our Endless Numbered Days by Iron & Wine and City and Colour. Those are all my favorites! Every battle has its own share of pain and glory. You have to weather the suffering in order to win the battle. Emily, mind over matter. You can do it. As soon as I saw "This holiday season, discover your inner elf" I thought of something really corny but extremely appropriate. "Discover your inner self". Yeah, yeah, I know that was a really obvious thing to say, but part of this battle is finding yourself amongst all the lies ED spreads throughout our mind and body. It is a battle, yes, but it's possible. There's always going to be down days, but there's always up days, too. Latch onto those up days, and use them as reminders. It is, like Leah said, mind over matter. But you CAN do it. 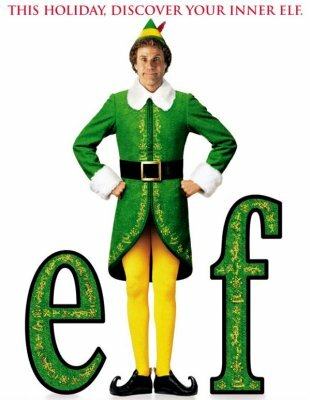 *cries* elf may be one of the saddest movies ever, and i think i may have been the last "good" movie that will ferrel has done. Well its amazing,i watched it hospital last year before Christmas and this year i shall watch it at home. Everything you posted in number one is exactly how I feel a lot of the time. It is definatly and Up and Down battle.. over and over.. and yes, I feel hypocrytical a lot telling people to keep going! and stay strong! etc.. and its true.. but I know I need to stay strong too. and to KEEP FIGHTING no matter what. I LOVE ELF!! Such a cute movie! I have no idea what I want for christmas this year... sigh. i need new tunage as well.. John Mayers CD is supposed to be fab. recovery is very much like a roller coaster - sometime you're up and sometimes you're down. even though you feel like you're in a down spout, stay positive. remember your motivations, and think about all of the good things that will come out of recovery (there are so many!). what am i asking for for xmas? new shoes! i've read the first 3 books and have mixed feelings... loved the 1st, found the 2nd one harder to get into because edward hardly appears in it haha, and the 3rd was pretty good. oh and ELF = LOVE! i completely know what you mean, recovery is one bumpy rollercoaster. i hate how Ed is so critical, even though there is no reason for him to freak out...this happened to me a lot last week, i don't think i was feeling safe or under control...all that seems to help is rationally telling myself that "i am okay"
have a great day dear!! Haha Elf! That movie is hysterical. Cotton headed ninny muggins.. lol. Christmas is going to be absolutley fantastic this year. Also, you might like The Hush Sound. Great stuff.